The god Apollo: master of the sun, the ultimate archer, god of music and poetry, immortal power unimaginable… trapped in the body of a gawky, acne-ridden teenage boy named Lester. Sent down to earth as a punishment laid down by Zeus, Apollo must set off on the second of his harrowing (and hilarious) trials. After facing the trials and humiliations of Camp Half-Blood, he and his companions seek the ancient oracles - restoring them is the only way for Apollo to reclaim his place on Mount Olympus - but this is easier said than done. Somewhere in the American Midwest is a haunted cave that may hold answers for Apollo in his quest to become a god again... that is if it doesn't kill him or drive him insane first. Standing in Apollo's way is the second member of the evil Triumvirate - a Roman emperor whose love of bloodshed and spectacle makes even Nero look tame. To survive the encounter, Apollo will need the help of a now-mortal goddess, a bronze dragon, and some familiar demigod faces from Camp Half-Blood. With them by his side, can Apollo face down the greatest challenge of his four thousand years of existence? 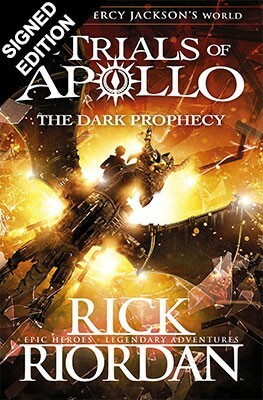 Rick Riordan is an undoubted master of modern mythology for children, his bestselling novels effortlessly bringing familiar stories to life for a new generation. Having established his name with the phenomenally successful Percy Jackson series, he’s also written Ancient Egypt into his Kane Chronicles books and, more recently, has brought the heroes of Norse myths into the mix with Magnus Chase and the Gods of Asgard. The Dark Prophecy is everything you'd expect from a Rick Riordan novel. It's quirky, exciting, hilarious and full of brilliantly written characters.